In a mind-boggling beautiful building we had our meeting. 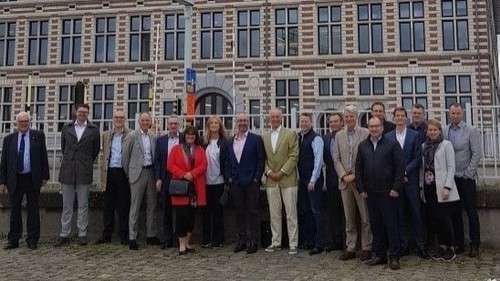 It started the night before with an exquisite dinner, offered by the Port of Antwerp, in one of the many restaurants in the harbor, allowing the members to enjoy the food and have time for networking. A new Executive committee was elected: Martin Naundorf (Infraleuna), Antoni Tora (BASF Tarragona), Eelco Vrieling Getec), Isabel Cardoso (Aicep) and Andres Labi (Baltic Chemical Park) were appointed and within a month they will decide who will be the new president and who will be the two vice-presidents. A new article in the constitution was proposed, opening the possibility to have an independent person to be member of the Executive Committee and even becoming President. Antwerp disclosed their secret why they are so successful. This is due to the fact that Antwerp is a very well located inland seaport, combining the position at sea and the proximity of the markets. Moncef Hadri of Cefic presented the trends in the Chemical Industry and his presentation is available on our web site. His main message is that though the share of the European chemical sector is diminishing, the sector is so crucial for the European economy, that we need to innovate more and produce smarter to stay competitive with the rest of the world. Therefore the priority of the EU, among other issues, is to make the best efforts to ensure affordable energy prices and they also should lower the cost of regulation. Our next meeting will be in Estonia on May 15th and 16th . Part of the program will be a visit to the shale oil mine in Estonia.